Garithes youvetsi is a typical Greek dish which is quick, easy and is perfect for entertaining or for a quiet night in. I can hear you thinking that the salty feta surely doesn’t go with delicate, sweet prawns but think again! With the careful balance of prawn to feta you can’t go wrong! I have used raw peeled king prawns for ease and to avoid having to cover myself in tomato sauce when trying to remove the shell but it’s up to you. Find a good quality feta that is both sharp and salty; avoid so called salad cheese at all costs! Feel free to pop in a couple of extra ingredients such as some baby spinach leaves or roasted red pepper for an added twist. 1. Preheat the oven to 180c/ 160fan ready to receive the prawns later on. Meanwhile, heat a glug of olive oil in a saucepan and warm over a low heat. Cook the onion and garlic for a few minutes until they soften and release their flavour. Stir through the cumin and cook for a further minute. 2. Next up goes the tomatoes. If you’re using fresh tomatoes then dice them; you can remove the seeds and skin if you like. Add the wine and away it goes! Most recipes that call for wine put it in the base of the recipe but many Greek dishes add it into the sauce directly; of course, if you’re feeling daring then you can add a splash of ouzo! Turn the heat up to medium and simmer until most of the liquid has reduced. Add in the oregano and half of the parsley and season to taste. If you wanted to add in a little spinach or red pepper then this would be the time to add it in. 3. Take two ovenproof baking dishes to each person has their own to dig into. Place the prawns at the bottom of the dishes before dividing the tomato sauce between the dishes and placing over the prawns. Crumble the feta over the top and bake for around 10-13 minutes until the prawns are cooked through. Sprinkle the remaining parsley to serve and you may also like to serve with a side salad or some hunks of bread. 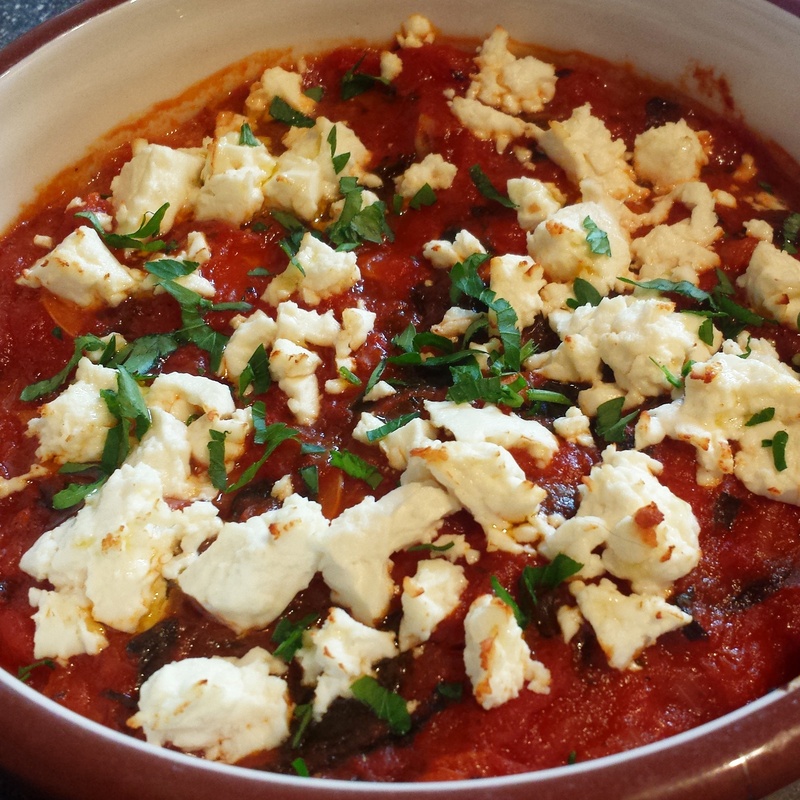 Garithes youvetsi- a taste of Greece in the comfort of your own home! Spring has sprung which means that British lamb is in season so get it while you can. I chose to use half a lamb shoulder but this would work with leg as well. If you are serving a large crowd then simply double the marinade ingredients and use a whole shoulder. 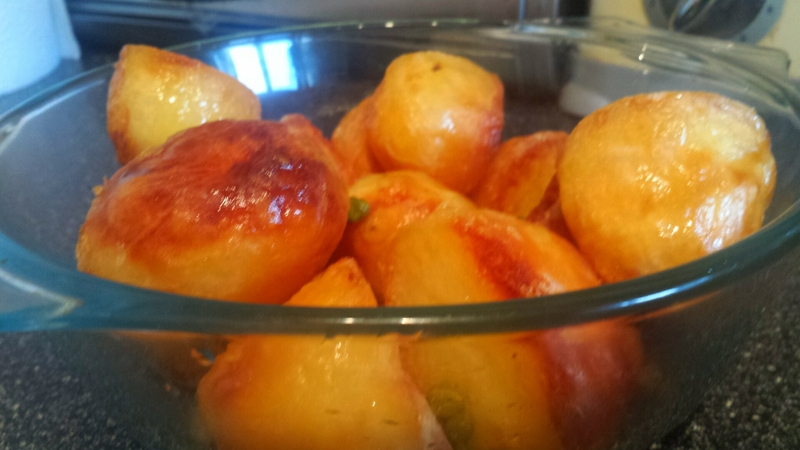 If the idea of roast potatoes gives you cold sweats then look no further- these work every time! I served the meat with a red wine, balsamic and shallot sauce which you must try- find the recipe here: http://whatchloecooked.co.uk/2015/04/04/golden-artichoke-and-spinach-gratin/. 1. Start off by marinating the lamb well in advance- the morning does the trick but you may want to do it the night before. Simply add all the marinade ingredients into a pestle and mortar and give it a good old bash until you have a thick paste. Rub the paste into the lamb, cover well with foil and pop in the fridge until you are ready to cook it. 2. To cook the lamb, preheat the oven to 150c/ 130 fan. I set the lamb on a trestle of cut onion segments and a little water (100ml will do) to give the lamb a nice steamy environment. 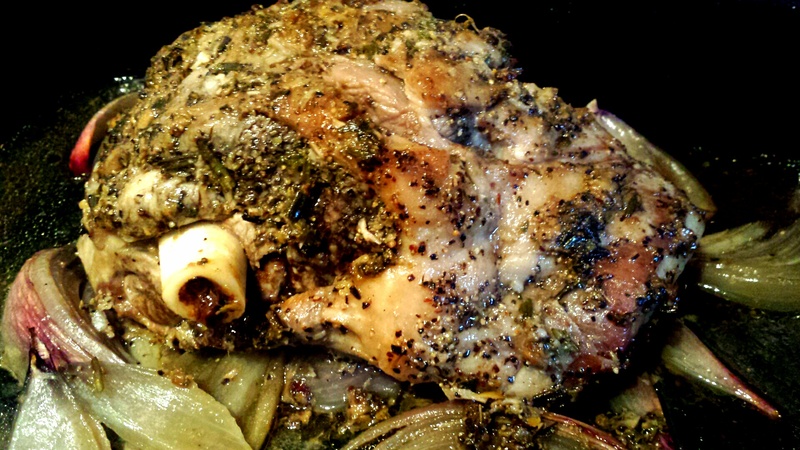 Pop the lamb joint on the top and roast for around 2 and a half hours until juicy and tender. Some ovens will vary so do check from time to time and baste the lamb. 3. For the potatoes, parboil halved potatoes in a large pan of lightly salted boiling water and drain well. Some recipes suggest you give the potatoes a shake to mess up the edges however I find that the act of tipping the potatoes in the colander during the draining process is enough. Heat a decent glug of oil in roasting tray and pop in the oven until hot. Add in the potato halves and turn in the oil. Roast with the lamb for around an hour until golden on the outside and fluffy in the centre. When they are ready, blot them quickly onto kitchen roll to remove any excess oil before squeezing over the lemon juice and sprinkling over the capers. I also like adding a few flakes of sea salt for a bit of extra seasoning. If you are like me, most capers end up being eaten before they make it anywhere near the potatoes so a few extra ones never go amiss! 4. When the lamb is nearly ready, remove the foil for around 10 minutes and finish off to give it a lovely colour before resting for 10 minutes. Irresistible Greek style spring lamb with crunchy lemon and caper potatoes- a winner this season!